As a WordPress blogger, you might have a habit of doing everything by yourself; whether it is writing blog posts, tweaking your theme, creating a landing page or setting up a WordPress security plugin. It is totally justifiable as there are a lot of tutorials out there, which would help you to do those things by yourself. However, you can offload work if you find WordPress developers for hire. When you’re not absolutely sure about what you’re doing, or if you are getting very busy with your own work, a risk-free method is always to hire an expert who knows the system inside-out. The beauty of working on this platform is that whenever you need a helping hand from a hired WordPress developer, it is quite easy to find and hire them based on your budget and your job specifications without any hassle. There are literally thousands of experts WP developers for hire. In this post, one of many tips we share, we’ll explain how to find WordPress experts and the necessary steps you should take to hire them for your next website development project. 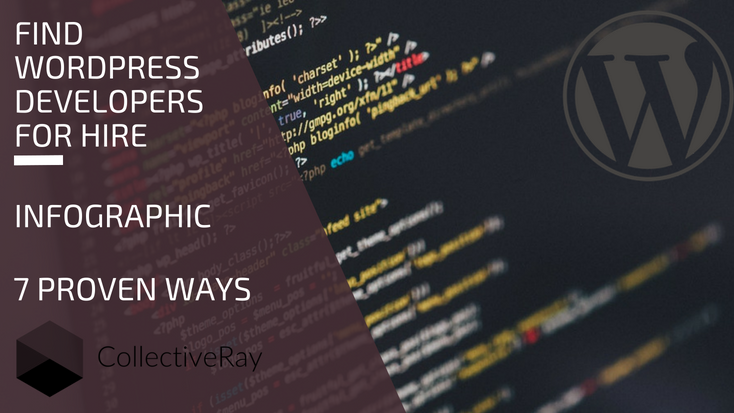 If you’re looking for some practical strategies that help you find great WP developers for hire you can use on your site today, then you’ll love this infographic. Before you start reading – are you looking for web developers or partners to help you with developing your website project? You’re in the (quite hard) position of having to find a good reliable partner, without getting screwed, or without losing a bunch of time (and money) with a low-quality services provider. But don’t let this scare you from outsourcing or offshoring. You just need to find a trusted company – and, we’re in a position help! We’ve been in the business for over 15 years, so we have already built a network of providers and suppliers who we know and trust when it comes to WP and web development services. These are fully project-based providers so there is no long-term commitment, exposing you to little to no risk. Before we actually start discussing how to find WP programmers for hire – we want to tell you a short story of how the hiring process of CollectiveRay turned out. We first tried hiring programmers on Fiverr. We set our project and budget. Not a cheap one mind you, we went for a small plugin development project. We were all set to find a professional. The first candidate we chose made a complete hash of things. Untested pages, broken and missing functionality. We dumped them and tried again. Same story, only this time, they were not responsive and they wanted payment outside of Fiverr (NEVER accept that). Then the work never materialized. Recovering our money was a huge hassle. We had to perform Credit Card chargebacks, and give proof that the work never materialized. The time we lost messing around with this was huge. Our clients were NOT amused. We were already starting to get discouraged and were really starting to wonder where we could hire good programmers. We then switched to another freelancing company. Same freaking story. We went through dozens of failed attempts at hiring good candidates. Suffice to say we learned our lesson the hard way. Today we go through a rigorous process of vetting hirees – it takes a lot of time and iterations and the results are not guaranteed. We’ve also mostly abandoned these dirt cheap directories of cowboys, newbies, and plain old clueless programmers. So let’s start with the first things first – you need to know what you’ll need to hire. A great project or designer brief is critical for you to be able to find the right skill set. Before we look at where you can find WordPress coders, you need to know what kind of people you’re looking for. So before we see locations or ways of finding programmers or maybe different websites where you can meet them, we need to actually create a specification. It’s the time to write down the project brief. The project brief will help you to communicate with your WordPress programmer effectively. For instance, if you’re looking to hire a WordPress expert to build a customized theme or plugin from the ground up, here are a few things to consider while writing a project brief. Goals of the project – you need to clearly state what you want to achieve through the web development job you’ll be hiring for. Is it theme customization? Plugin customization? Is it the development of a website plugin? Budget – it is essential that you are upfront with how much you intend to pay for this WP development task. Your programmers will need to understand the scope of the project even from the budget you will be allocating. You, on the other hand, will want to know how much the job is going to cost you. Projects might not seem as simple as you think, so have some leeway. Success evaluation – if you’ve worked with an agile approach such as SCRUM, you’ll know that success of task does not depend on how something is achieved but what the success criteria of the end result. Same goes for your website project, your programmers need to understand how you will define a successful project. Explain the frontend and backend features (development). The exact look and feel of your theme or plugin (design) – it’s best to use a mockup tool to do this, which will allow you to generate what you have in mind really quickly. For theme development, in particular, you need to make sure you take nothing for granted, they can get pretty complex. Will you cater to responsive and mobile devices? Will you need a customization framework? Resources/ examples: Show examples of your competitors’ websites or websites for inspiration. Milestones: you’ll need to decide a number of milestones for development. You’ll want to monitor progress and milestones are the best way to have an agreed point where you can decide whether development work on your job is on track. Payments: this is, of course, something which is very important both parties. Some sites will actually have an escrow facility which will protect both of you. If this isn’t in place, you should agree in writing how things are going to work. Terms of payment should be determined beforehand. Deadline: for sure you need to have an end date for when your WP designer for hire is to submit their work. You should also agree what happens if the deadline is missed, to make sure that development stays on track. Communication: like with any other job, communication is critical to the success or failure of any project. Agree beforehand how you will communicate, whether it’s by email, chat, messenger, Skype or what have you. If you are in different time zones this is especially important, because their day might be your night and you will have a turnaround time of about a day. Set expectations on both sides to make sure you don’t get disappointed. Output and deliverables: if you are developing a plugin or theme for reselling, you need to agree what is going to be part of the job or not. You are more than likely going to need designs, copy, documentation and plenty of other outputs. Agree on what makes part of the job and what is outside of the scope of this web development job. Intellectual property: if you are hiring a contractor, especially on a freelance basis, who is going to own the Intellectual Property of the developed end product? Decide whether you want to implement an auto-update mechanism or not. What will happen if some bugs are discovered after you’ve agreed that the job has been completed? Will they give you a warranty period? How long will this be? What happens when the warranty period expires? How would you resolve any security vulnerabilities which might be discovered? Again, security vulnerabilities should be considered serious bugs which need to be fixed within a very specific timeframe, and this should be agreed beforehand. Even if these are discovered, months or years after the job has been completed, there needs to be clear terms of reference. 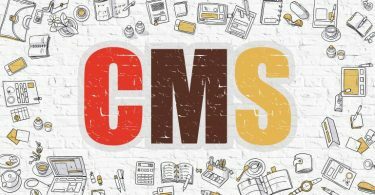 CMS development, in particular, is very prone to these issues. You’ll probably want to keep on developing your project, so it would be great if you agree beforehand how updates would happen. 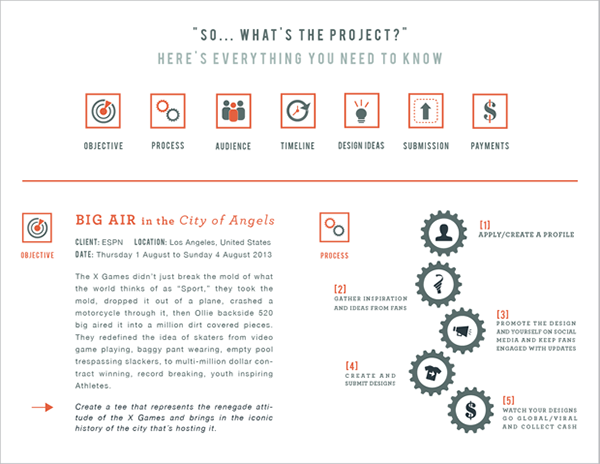 The above points will give you some basic idea of how the project brief should be. The more things you agree before your actual hire a WordPress designer, the better and the less likely that there will be a conflict later on in the project. In fact, the quality of your deliverable heavily relies on the project brief you create. Make sure you explained everything in the brief, so it avoids any disappointment down the track. If you plan to do this often, you might want to set a contract template so that each time you plan to hire a freelance WordPress developer, you’ll just need to update the specific sections. This will make the hiring process shorter, whilst making sure you are covered from all aspects. If you’re looking for programmers on a full-time basis, rather than a project brief, you’ll actually require a full job description of what the job will entail. 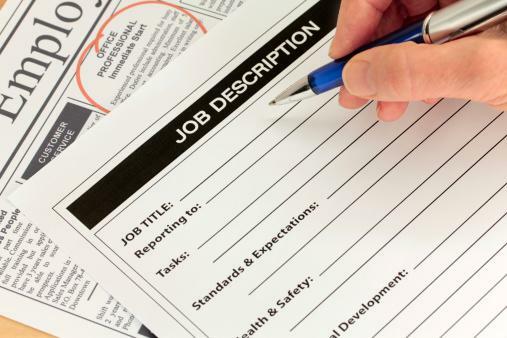 We’ve listed below a complete sample which you can copy and use for your own hiring process. <Brief description of the company doing the hiring> is looking for a <scale: junior, senior, intern, part-time, freelance> WordPress developer to join a team of five in-house programmers to expand our capacity and skillset. Our primary aim is to fill these openings with <full-time | part-time | freelance>, <remote | on-site> developers. Develops custom, often complex WP-based solutions along with PHP framework-based solutions (e.g. Laravel). Aids sales staff, account managers, and others in requirements gathering, web project planning, and general technical questions. Provides leadership in finding/developing new technologies and methods to advance the company’s web offerings. Aids other in-house developers with system design and implementation. Performs server maintenance and monitoring. Supports current client websites by providing technical support. Works with: Principal, brand strategists, brand managers, designers, WordPress programmers, development, account service, copywriters, online marketing team members and <other positions in your company> ; regularly engaged in internal and client meetings to explore and confirm project scope. Communicating with the customer when necessary, through various means, such as email, call, on-site visit etc. You should add or remove sections which don’t apply to your specific needs. Also, adjust anything between the < brackets > to suit the needs of your hiring scenario. But before you do … a quick shortcut. There are many ways to find web developers for hire who can meet your requirements. Let’s look at a few of them. Finding a good website developer for hire is not something which comes very easy. Unless you use a good screening site such as Toptal below, finding a good developer will take time. This is because, besides great programmers, you’re going to find people who don’t have the necessary skills, scammers and others who are going to be a waste of your valuable time. 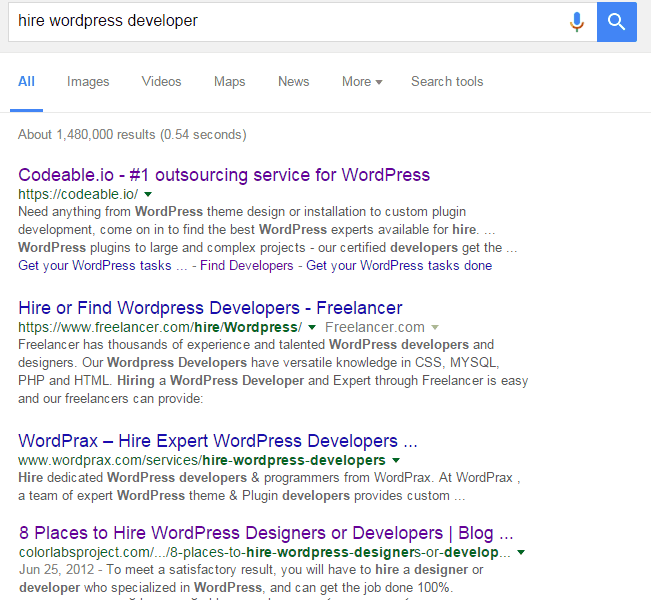 When finding a WordPress developer for hire, first give them a very small job. Something which is not very high profile, not urgent and something which you know how it should be done. With this first job, you can gauge the functionality, expertise, communication, timeliness, budgets and in general, develop a good relationship with the designer that you want to hire for future projects. If you start hiring without your own screening process, get prepared for a few miserable failures. Today, we only employ pre-vetted developers. To do that we go directly to the horse’s mouth. Toptal – our favorite marketplace employs the top 3% of talent only. Candidates they send you have been thoroughly tested before they are accepted as freelancers. We do highly recommend that you start your search for a developer at Toptal. Toptal is one of the best choices if you’re looking to hire top developers around the world. In order to identify the best talents, they’ve developed a rigorous screening process and don’t accept anyone who applies as a freelancer. They claim that out of thousands of applications, only fewer than 3% are accepted and everyone who is accepted is a senior developer or designer. Is hiring from Toptal a right choice for you? If you’re looking to hire a WP developer for part-time, your budget must be $1000-$1600+/week. Another thing to be noted is that Toptal is not available for every country. Click below to find out if Toptal is available for your country. Using Google search is one of the best ways when it comes to finding a freelancer or an agency that is specialized in WP. Once you find their websites, all you need to do is to look at their portfolio, testimonials and start talking about your assignments. With that said, for finding a WordPress expert if you used a generic search query on Google like “wordpress developer for hire” most likely it won’t cut it. You might be expecting the result that contains relevant websites of freelancers and web development agencies. In reality, you would end up with search results that include blog posts on the topic “hire a WordPress developer” or bidding sites that are successfully ranked well on such keywords. Having said that, how would you effectively use Google to find a freelance WP developer for hire of services through their blog or WordPress website? Instead of doing a generic search, enhance your search query by using Google search operators like ‘inurl’ and ‘site’. The above search query will restrict the results to the pages that contain the word “hire me” in the URL. In addition, it also avoids showing any pages from wp.org. These are more likely to find good results. You are free to make any changes to your search query as per your requirement. The basic idea here is to find a huge list of freelancer websites, so you can compare their services easily and hire the right WordPress programmer who meets your requirements. Job boards are great places to find freelancers for hire. The best thing is that unlike Google search, you don’t need to spend time on searching and contacting them individually, instead, the programmers for hire will contact you, which can help you save significant amounts of time. All you need to do is to list your job on these sites and compare between the proposals you receive from the applicants. Below is a list of popular places where you can find WordPress programmers for hire. Unlike Smashing Jobs which we will see below, it is specifically targeted to WordPress related jobs. With the job board being dedicated, you’re going to find plenty of WordPress designers for hire. WPMUDEV, is one of the biggest companies around WP, so you would expect to have both users and coders congregating around the site. To make easier for everybody to find hires, the guys at WPMUDEV actually have a Job Board where you can list your job. Again, since anybody can apply for your job, you’ll have to do the vetting of the hired WP developers yourself. As it is integrated with award-winning Smashing Magazine, it is one of the best ways to find creative professionals including programmers and designers for hire. The job board is very busy, and posting a job here requires commitment from your side. In fact, posting a freelance job entails a fee of $75, whilst a fulltime job has a fee of $225. In reality, you should treat this as a normal hiring process – with interviews and assessment of skills as necessary. The difference with this board is also that you won’t just find wp coders for hire. It is open to all types of web designers, so finding WordPress experts will require some sifting. This job board is not just a section of any popular website. WP Hired is a dedicated job board website for WordPress services. That makes it another excellent place to hire a WordPress developer. If you just have a quick job, you should be able to post this on the free plan, which allows you to post 1 job which stays up for 1 week. If you want your jobs to stay up for longer, and increase the chances of getting more respondents, you might want to go for one of the paid plans, which start from $39.99. Of course, you are going to have to make your own selection here. The programmers you hire here can be anyone who is able to upload a resume, so you’ll have to go through your own selection process. Another way to find candidates for your next project is using a bidding site or an outsourcing site. Best of all, this approach is one of the easiest ways to find and hire a designer or programmer. Let’s look at a few outsourcing websites below including bidding sites and service marketplaces. Codeable claims to be the best outsourcing platform that is targeted specifically at WP. You can fulfill almost any kind of WordPress related jobs. This site is 100% dedicated to WordPress services outsourcing. Like Toptal, Codeable actually vets their applicants and only allow the top 2% of applicants submitted to join their ranks. This is, of course, a sure way of knowing that any people you hire here are going to be at the top of the game. Again, an excellent place to find web development experts for hire. You don’t really post your job here, you tell them what you need and you’ll get a quotation and then the development process kicks off from there. Upwork is a brand new bidding site launched by integrating popular freelancing platforms Elance and Odesk. All you need to do is to create an account on Upwork, list your job and accept bidding by freelancers. Once again, people for will contact you, make an offer, show you their work and experience and then you select which offer you prefer. Incidentally, given that we’ve mentioned both Toptal and Upwork in this article, you might want to check out our Toptal vs Upwork article. Just like other freelancing sites where no vetting is done during the application process, you’ll need to screen the people you hire. We’ve had good and bad experiences hiring from Upwork, so make sure you read Upwork reviews and start slowly with any hiring and ramp up as you assess the quality of the developers. A word of note, Upwork is flooded with users from India, Pakistan, Bangladesh and other developing countries. Make sure you find a professional who is able to work according to good work ethics. Fees for development work are agreed beforehand, but you are typically able to determine the budget. Of course, if you set a budget which is too low, you are probably not going to get much quality. You’ll need to engage with the freelancers and negotiate as necessary many times. This wouldn’t be one of our primary recommendations, despite its popularity. 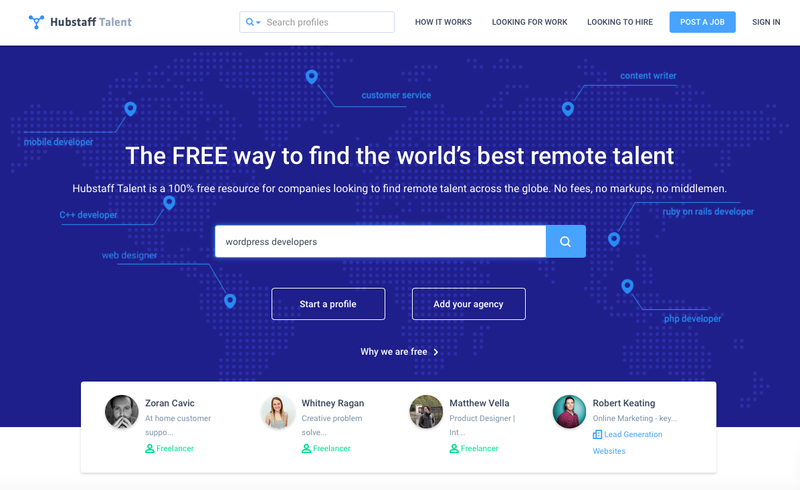 Another growing way directory of freelancers, including WordPress freelancers, is HubStaff Talent. Whilst most freelancer marketplaces we mentioned here (or the more common ones) actually charge various fees for using their services, HubStaff takes a different approach – it is 100% free for both freelancers and businesses. Freelancers simply create a profile and then wait for businesses to get in touch – with no middlemen involved. If you’re looking for hiring WordPress programmers, you can also post a job on the recently launched “Jobs” section. Whilst we love the approach of reducing the barriers to both the freelancers and the businesses when it comes to finding web designers, we do feel that this freelancer directory will also require you to fully vet the people you get in touch with, just to make sure they’ve got the right skillset for the job you will be engaging them for. Envato Studio is a marketplace for small services where you can outsource your development jobs to WordPress professionals. What makes Envato different from a bidding site is that instead of listing your job and asking freelancers to bid on it you can handpick them based on the services they offer. Again, if you want to hire website designers, you can hang around and ask around for a while and then take your pick. Although this may seem attractive initially, you’re still going to do some homework to make sure the WP developer you hire has the skillset you are looking for. You are going to find plenty of people who are going to cut prices to get jobs and you should gauge their quality before going for any important development jobs. There are plenty of other places where you can engage potential hires, especially if you are looking to work freelance. Once you’ve selected a few potential candidates, write down their skills and compare it to the project brief. This is because, at this point, you’ll need to figure out whether the hired WP developers can deliver what it takes to complete your project. Reviews also go a long way towards showing whether the person should be hired as. Whilst not a perfect picture and reviews can sometimes be manipulated, users with excellent reviews, a long history and plenty of earnings are a good choice for hiring for your next website. New users with little to no earnings and a very short registration time are probably fraudsters or people who have earned bad reviews and had to close their previous accounts and create new ones. Sometimes, there’ll be some mismatch between the requirements and their skill set. For example, not all designers can carry out the complete process of a theme creation. For a developer, it is far more likely to take a PSD file of the finalized design and create a working theme from it. Speaking of themes, this roundup of the best WordPress membership theme options and plugins is an excellent read for anyone wanting to create a members WordPress site. In such cases, you may want to find a designer and a developer separately. Remember, communication is the key here. No matter what expertise your client has, unless you communicate with them properly chances are you would end up with a half-finished product. In addition, make sure you take a thorough look at their portfolio and figure out what kinds of websites they used to create, so you get an idea of their work. Make them an offer, hire and start coding! Once you’ve made a shortlist of potential hires who are a great match, you can (or rather should) communicate directly with them. You’ll need to discuss any queries they may have, ask any additional things you may want to know and clarify any doubts you may have. You may want to ask or review any references at this point, probably this is the point where you might want to make a few calls to references provided. Once you’re completed satisfied with the capabilities of the people you’re dealing with directly, make a hard decision based on the consensus of your team, or based on your gut-feeling and choose who you want to work with. Do trust your gut feeling. It works. Once your chosen candidate accepts your offer, at that point, you’re ready to start your web development project! You’re ready to start coding. Over to you, what’s your process for finding the best WordPress developers? Have you ever hired a WordPress expert for your projects? What are the measures you take for due diligence? What are your favorite websites for meeting a development expert? Tell us your good and bad experiences with finding WordPress developers for hire.